Earlier this week I gave you a sneak peak of a project I was working on. Today I am so glad to be able to show you the finished products. 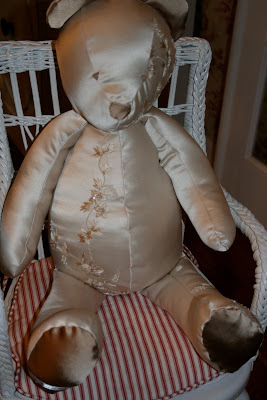 This special bear is for a baby shower I am attending tonight. The bear is Simplicity pattern 5461 and made from the wedding dress of the Mommy-to-be. It is a surprise for her, something she wanted to have done but is not expecting it now. I've been working under cover with her Mom. The Mommy-to-be does not read my blog so I do believe we are safe! I have to tell you, I did have a moment when I made the first cut into the beautiful wedding dress. I thought I might be sick, actually. There is enough fabric left over for a few more bears for future wee little ones. I finished my gift for her also. She does not know if she is having a boy or a girl so I had to keep it pretty neutral. Of course now that the sweater and hat are done, the weather here is expected to be in the low 80's as we head into summer. There's always air conditioning, right? 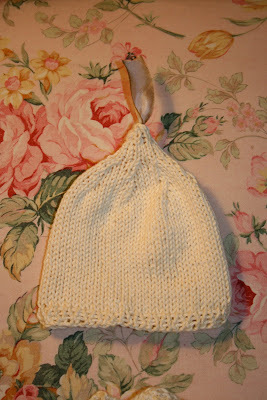 I love the shape of this little hat. Can't wait to see the darling baby that will wear it. So much fun! How sweet is that little sweater and hat you made and the teddy bear is an heirloom I'm sure she will treasure. I feel like you do about cutting into the dress! 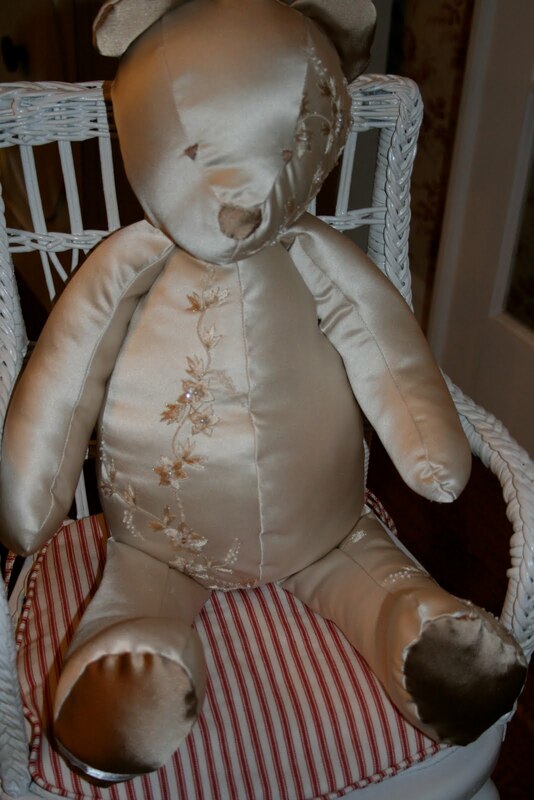 It must have be a gorgeous dress; this bear is beautiful. Very nice sweater set as well. You have so much talent! What a sweet lovly bear !!! what a talent you have !! Oh my, the first cut into a wedding dress would be a hard one! I'm not sure I could even do it. But the bear is wonderful, and the sweater and hat, oh I LOVE them in the soft neutral creamy color. Fantastic! That little bear is so beautiful. What a wonderful job you did. The little sweater and hat are so precious. What a fabulous idea! The sweet bear is just gorgeous Renee! 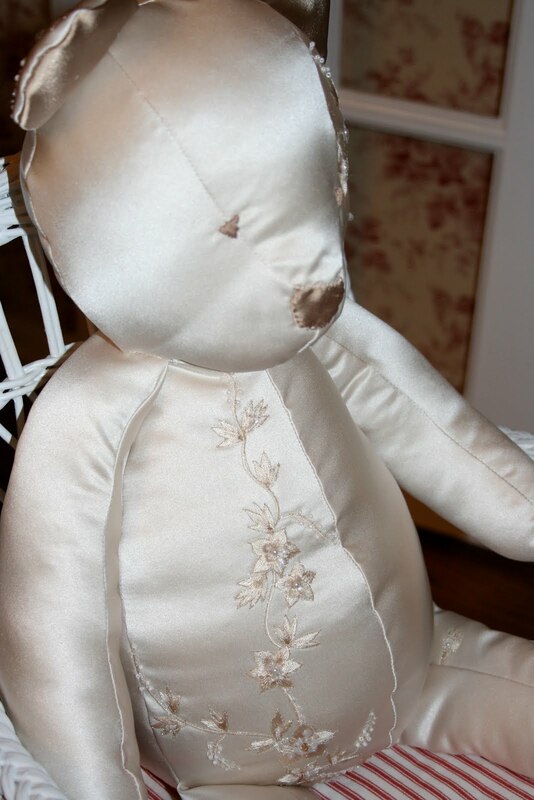 I've seen pillows made from wedding dresses but never a bear. Love it!! What a precious bear! Your work is beautiful. The little jacket is so sweet! 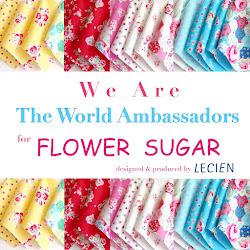 I wanted to let you know that your beautiful blogspot inspired me to contact Michelle at Shabby Creations and she is working on getting my blog in good shape! What beautiful gifts you have made! 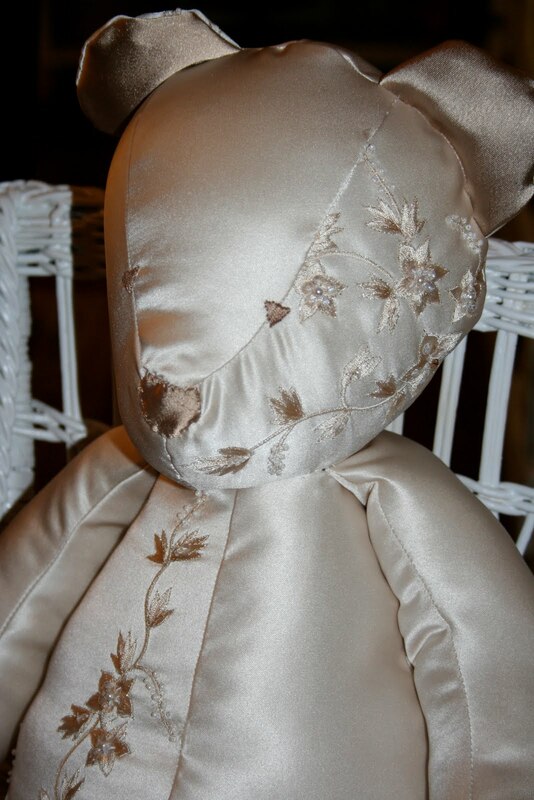 How very special and meaningful to make an heirloom for Baby, using the mother's wedding dress. I can feel your anxiety as you made that first cut. I sometimes watch "Say Yes To The Dress" on The Learning Channel and see what most women go through picking out their wedding gowns, so it's hard to imagine cutting into one. But the preciousness of the dress is what makes the teddy bear so dear. And it is so beautiful. I really love the little sweater and hat you have made, too. So, so sweet. And such wonderful things to show us for Friday Pretties. Wishing you a beautiful week. The bear and the sweater set is absolutely beautiful! I know she will appreciate them so much. What special gifts these are. The knitted sweater and hat are adorable. I like the shape of the hat...kind of like an acorn.